Have you ever wanted to be a football manager, but never has a chance of doing this? Do you think you have tactical prowess to out master Hiddink, Diego Simeone or Jose Mourinho? Sky Fantasy Football is the best place where you can showcase your prowess by competing with other players from all across the world. 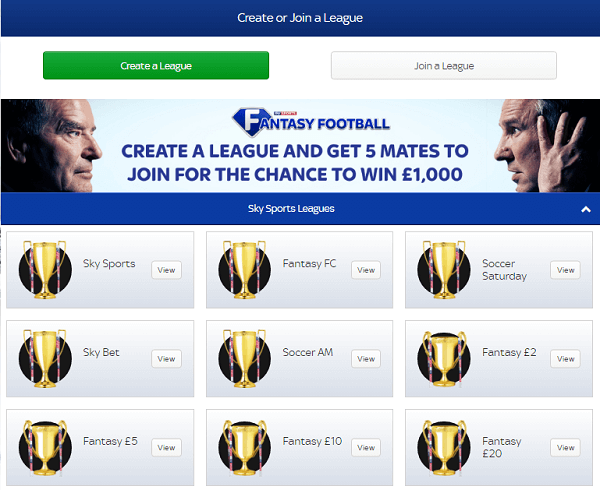 In Sky Fantasy Football, every person participating in the league will have an opportunity of picking a unique squad consisting of 15 players. These players will be selected for the next 38 weeks when the premier league action continues. You will always be required to pick 11 players from your team who will feature in your lineup while 4 players remain in the bench. 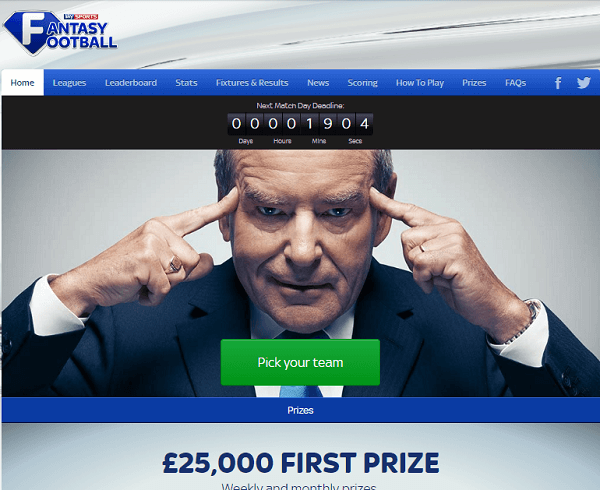 Unlike the other fantasy football leagues, the Sky Fantasy Football League allows you to work with a salary cap which allows you to pick a team of your choice as long as it’s within the budget. Moreover, they are planning on introducing a feature that hasn’t been online before. The feature will require only a single player to be owned by a single person in the league, i.e., if you own Alexis Sanchez, no other player will be allowed to own him. If they wish to own him, they will have to offer you multiple players in return. The first thing required of you is signing up with the site and create or join an already existing Sky Fantasy Football League. Once you are signed up with a league, you can now have the opportunity of picking the various players that you would wish them to feature in your first team. 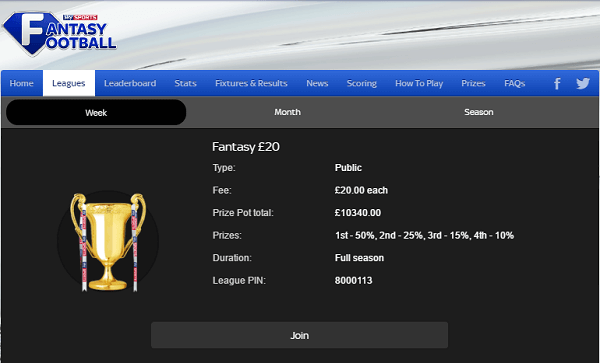 Sky Fantasy Football has various leagues to offer its players. It has the classic leagues the private league, public leagues and the head to head league. To join some of the leagues, you will be required to have the Sky Fantasy Football League codes that you will be sent by the admin of the league you wish to join. This is one of the Sky Fantasy Football League where all the teams in the league are normally categorized depending on the number of points that the teams have scored throughout the season. Once you sign up with the website, you are automatically assigned into a particular league. There is the overall league where all the players from different countries are ranked, there is the countrywide league where players from your country are ranked and there is the league where players supporting a particular team are ranked. This is another type of league where you compete with players from other countries or friends. 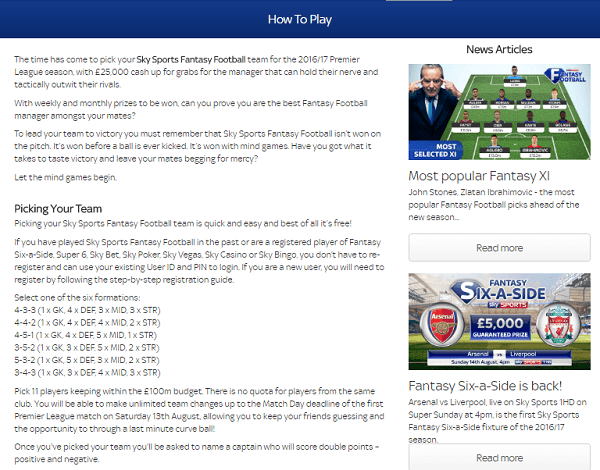 To join a head-to-head league, you have to ensure that you have the Sky Fantasy Football league code. You can have access to this code by asking the league admin to send it to you. In the head to head league, your team shall be playing against an opponents’ team every week of the season. Similar to the English Premier League, every win that you have is worth three points, a draw is worth a single point with a point giving you no point. If the number of teams in the leagues is odd, then each week, there will be a team that will be playing against what every team shall have scored in the league. The fixtures will go all round the season. If a league has ten teams and runs for 38 weeks, then every team will play against each other four times starting from game week one to game week thirty-six, and during the last two game weeks, the teams will continue playing against each other. Eventually, every team will have played against each other 4-5 times. The teams that will play five times in this Sky Fantasy Football League are usually randomly chosen but by the time the season comes to an end, all the teams in the league shall have played 38 matched in total. You are only allowed to join a maximum of three public leagues. To join the public leagues, you don’t require the sky fantasy football league codes with the only requirement being able to select a league of your choice. Once you are enrolled to a league, you will be pooled against other random players from all over the world. The private leagues work in a similar way to the public leagues only that they require you to have a password to join them. Unlike the public leagues, the private leagues can start at any time of the season and usually have a moderator or an admin who’s sole responsibility is ensuring that only allowed members can join and take part in the leagues activities. 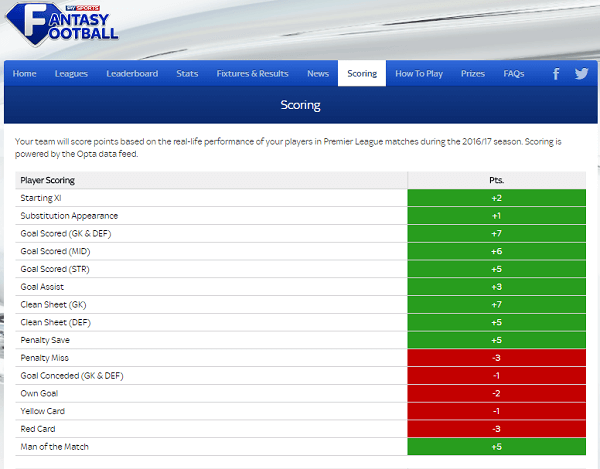 Throughout the season, the players will score points based on their performance in the league. When a goalkeeper or defender scores a goal, there will be 6 points awarded, a midfielder will have 5 points awarded while a striker will have 4 points awarded. An assist is worth 3 points. A clean sheet by a defender or goalkeeper is worth 6 points, while a clean sheet by a midfielder is worth a point. A penalty save is worth 5 points while a miss is worth -2 points. A yellow card is worth -1 points while a red card is worth -3 points. An own goal is worth -2 points. Throughout the season, you have to ensure that you abide by these rules. Every squad has to have 15 players: 2 Goalkeepers, 5 defenders, 5 midfielders, and 3 forwards. Every week, you have the opportunity of choosing 11 players to play with four players to sit on the bench. The players on the bench will replace an on-field player who will not be fit enough to play during the game week.